Thanks to Summer for sharing her birth story with us! It was Sunday, February 8, 2015. I was 41 weeks and one day pregnant with my fourth child. I had prepared for this birth by taking the Hypnobabies class with Nashville Birth and Babies, with Kate Cropp as the instructor. Unlike my three previous births where I had prepared using the Hypnobabies Home Study option, I chose to sit through the class to prepare for my fourth birth. I had great success with the Home Study option, but because I am an aspiring Hypnobabies instructor, I thought it would be a good idea to attend the class. Hypnobabies Thursday night classes were like date night to us. We left the other three kids with the baby sitter and enjoyed a quiet dinner together before going to class to learn about turning off my mental light switch and directing my anesthesia. We diligently practiced the scripts at home, with Dan reading to me and guiding me through hypnosis on my nights at home from my job as an ICU nurse. Attending the class ignited a sense of responsibility in Dan he had never had before during my previous pregnancies when I did independent study . He took ownership in ensuring I had a wonderful birth experience by helping me to practice my hypnosis skills. Hypnobabies teaches that thoughts, emotions, and fears are very powerful. Fear can hinder us, and what we believe becomes our reality. The day I was 41 weeks pregnant was a tough one for me. I had many things weighing heavily on my mind that day. Dan understood I was having a tough time emotionally, so he took me out for the day. His parents were in town, so we left the kids with their grandparents and we went out for the day. I got a pedicure, we had a lunch date, and we walked around stores looking at cute baby clothes together. It was a welcome distraction. We went to church together on Sunday morning and ate lunch out before heading home. As we cleaned up our table, I looked at the clock on my phone and announced that it was 1:00 and it was safe for my birthing time to begin. As I buckled myself into my seat back at the car, I felt my first pressure wave. When we got home, I retreated to our bedroom and listened to Fear Clearing (a Hypnobabies hypnosis track for eliminating fear) before lying down for a nap. I was only able to actually sleep for a little over an hour before the pressure waves woke me up. At this point, they were coming every five to ten minutes apart. Feeling excited, I texted my friend and doula Julie to let her know what was going on, but not long after proclaiming my pressure waves were five to ten minutes apart, they spread out to 20 minutes apart. I’m a little fuzzy on what happened next. I’m sure we ate dinner, but I have no recollection of that. I do know that my mother-in-law took my father- in-law to the airport so he could fly back to Chicago around 7:00 PM, as he had to work the next day, but she was staying in Tennessee. We didn’t tell them that I was possibly in my birthing time, because my pressure waves were spreading out and we weren’t sure if it was really happening that night or not. We went to our room and I texted Julie an update. I know I was feeling discouraged at that time. I felt like I was letting people down and I didn’t want to inconvenience anyone. Dan assured me I was not letting him down and that I was not an inconvenience. I began to feel a little better and decided to fold a basket of laundry that was sitting in our room. Perhaps it was one last surge of nesting. We had the best time folding that laundry, and I know we laughed a lot, but I can not remember what we found so funny at the time. I think Dan’s pep talk and laughing over the laundry basket jump started my birthing time. I had three pressure waves back to back. We went to bed early and practiced the “Visualize Your Birth” script before falling asleep. I slept maybe an hour before the pressure waves woke me up. I lied in bed through three pressure waves before waking Dan up. We timed the pressure waves and found that they were about three minutes apart. I texted Julie at 12:19 AM on Monday, February 9 to tell her we were back in business. I told Dan I wanted to take a quick shower, but he quickly shot down that idea. 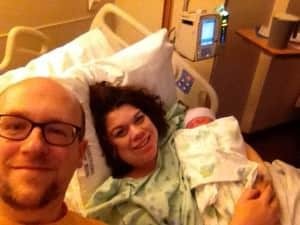 He was afraid we would have a repeat performance of our third child’s birth, where we arrived in the circle drive to the hospital 11 minutes before he was born, resulting in a wild wheelchair ride through the back hallways of Vanderbilt Medical Center and our son being literally caught by the midwife when I stood from the wheelchair. I agreed that the shower might not be a good idea after all. I could see myself getting so comfortable in the shower that I had an unintentional home birth. Julie arrived around 12:45 and we left for the hospital soon afterward. I hugged my pillow and put my ear buds in and listened to the Deepening track for the drive. I switched my mental light switch off and relaxed into my pillow and focused on maintaining my anesthesia. I told myself over and over in my head that I only needed to be four centimeters dilated to be admitted. Anything less, and they would say I wasn’t in my active birthing time. Although my eyes were closed and I was in deep hypnosis, I knew where we were on the highway at all times. I recognized the on ramp to I-65 off of 840 and I began counting pressure waves. When we pulled into the circle at Vanderbilt, I turned my light switch back up to center switch so I could walk and talk in between pressure waves, and announced to Dan that I had had nine pressure waves between 840 and the circle. It was about a 30 minute period of time between 840 and Vanderbilt. We parked in the garage, not knowing we could have utilized a free valet at the ER entrance, and Dan pushed me in a wheelchair we found in our parking space. We checked in with the registration clerks in the ER and waited in the hallway with another couple for the labor and delivery nurses to come pick us up. My pressure waves continued to come every three minutes, and I turned my switch off and completely relaxed through each one, then turned back up to center switch when each one was finished. After waiting a little while in the ER, the OB nurse came and took us upstairs to OB triage. There were several patients in triage that night. The nurses put me on the monitor and were surprised when I told them my pressure waves were every three minutes because I was very calm and relaxed. The nurse checked and I was 4.5 centimeters, 50% effaced, and at a -1 station. The entire ride to the hospital I had told myself I only needed to be four centimeters. I was very pleased and I am still convinced that my hypnosis made the difference. I only spent about ten minutes in triage before being transferred to labor and delivery. My triage nurse commented as she handed me off to the labor and delivery nurse that I should “teach the class” because I was doing so well with my hypnosis. Once in labor and delivery, I was placed on the monitor for the 20 minute strip before being disconnected for intermittent monitoring or getting into the tub. I was excited about the prospect of being able to relax in the tub. Before my 20 minutes on the monitor were finished, however, the nurse noticed something abnormal on the strip. I’m not entirely sure what the problem was, but she spoke with the midwife and I was given a bolus of IV fluids. Around this time, my pressure waves became very intense. Pressure waves, to me, anyway, are like a blood pressure cuff. The cuff gets tighter, and tighter, it peaks for a few seconds, then slowly releases. I’ve always pictured my pressure waves to be like a blood pressure cuff. During the transformational stage of birthing time, it is as though the blood pressure cuff quickly pumps to 180 millimeters of mercury in just a few seconds time, and holds there for several seconds before releasing, only to pump back up again a minute later. I informed the nurse it wouldn’t be much longer. The midwife came back to check me and I was at seven centimeters and a 0 station. I turned my light switch to off, but used the “Peace” cue through each pressure wave to keep me centered and to help me to relax into each wave. I announced I was ready to push. The midwife, standing at the foot of the bed, casually said, “Okay, just push when you feel ready.” So I did. I don’t think she was prepared for me to be such an effective pusher, though, because she told me to slow down. I didn’t do the typical purple pushing that you see on medical dramas, such as TLC’s “A Baby Story.” Instead, I pushed as I felt the need to, and I exhaled, vocalizing as I pushed, but never holding my breath and bearing down. I pushed through just one pressure wave and then she was out at 3:42 AM. I remember feeling surprised that it was so easy. This was the first time I had pushed while lying on my side, and I have to say, it was probably my favorite way to give birth. Dan announced that we had another girl and I rolled onto my back and she was passed up to me. This was the first time I had ever held one of my babies immediately after birth. I was in awe of how quickly and how easily she was born. She was so tiny in comparison to her older siblings, especially considering I was pregnant with her the longest, at 41 weeks and 2 days. Sarah’s birth was vastly different from my other birth experiences. 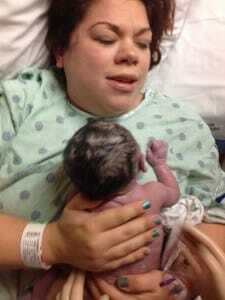 Although I had IV fluids and oxygen, I was very satisfied with her birth. I felt as though our nurse was on top of keeping us safe, while at the same time respecting our choices. While I had never before experienced a birthing time that had several starts and stops like Sarah’s did, I felt very relaxed and rested. I truly enjoyed her birth. While I felt well prepared in using the Home Study option for Hypnobabies for my three previous births, I felt as though taking the class gave Dan a little more ownership. I think nightly practice brought us together as a couple. His only regret about Sarah’s birth is that he didn’t get the chance to do more hypnosis scripts with me during the birthing time. He really enjoyed participating and helping me with my hypnosis! I have no regrets whatsoever. I am so blessed and so very, very thankful. Read Sarah’s entire story HERE.